Home / Feature Slider / “Angry Birds” movie is a lackluster, lame duck adaptation of the annoying video game. “Angry Birds” movie is a lackluster, lame duck adaptation of the annoying video game. Red is angry about everything. As miserly as Ebenezer Scrooge, the bird – who has eyebrows that rival Cara Delevingne’s famous facial trait – reacts with violence to anyone in his island community who dares to annoy him, especially while they’re happy. After one such incident, a ‘court’ sentences Red (Jason Sudeikis) to the harshest punishment possible: anger management classes. Red goes but refuses to take part in the bird yoga and poem-writing that the teacher, Matilda (Maya Rudolph), an annoying Namaste-type, wants to impose. The lives of the flightless birds are shaken up when a ship arrives on the island. Out comes two green pigs who proclaim they want the friendship of the birds, and mean them no harm. The pigs are immediately accepted by everyone, bar Red. His suspicion is raised further when the pig leader, Leonard (Bill Hader), produces some more pigs during an entertainment piece for the birds. Red, along with two of his fellow anger management attendees, Chuck (Josh Gad) and Bomb (Danny McBride) decide to investigate, and when they sneak on to the ship, they discover a drove of green swine hidden in the hull. But not even this is enough to convince the naive islanders that Leonard’s intentions are anything less than pure. 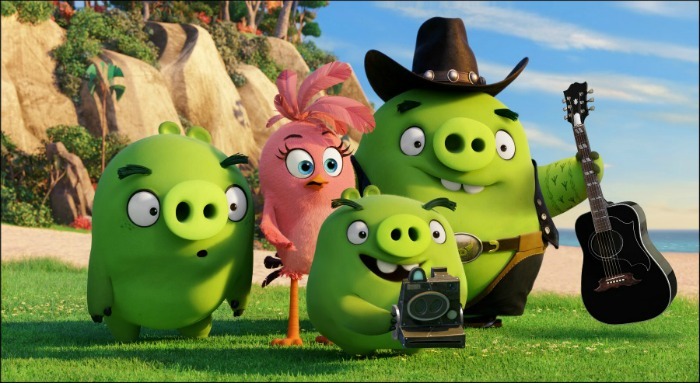 Suspicious green swine in the Angry Birds movie. When the pigs steal all the birds’ eggs – which are basically unborn ‘children’ in this context (a rather disturbing and macabre idea) – and make off to their kingdom to have a yolky feast, Red, Chuck and Bomb go in search of the only bird on the island who can fly: the legendary, heroic, Mighty Eagle. The latter (voiced by Peter Dinklage) turns out to be a gross disappointment: egotistical and too fat too get off the ground. Now it’s up to Red and his cohort, to hatch a plan and prevent near-born hatchlings from becoming scrambled eggs. Fans of the record-breaking popular video game on which the film is based (the most downloaded free game series ever) might enjoy seeing how it has been adapted for the big screen. But for those who, like me, viewed it as an annoyance and ultimate waste of time (if you’re a gamer – sorry, not sorry), Angry Birds the movie is a lame duck. It’s a disappointing turn for directors Clay Katis (responsible for clever, hit animations like Frozen and Tangled) and first-timer Fergal Reilly (who worked as a storyboard artist on Hotel Transylvania and Cloudy with a Chance of Meatballs). Not even Red’s on-point sarcasm can save a weak script and 3-D animation that would have been considered good five years ago. Previous: Conspiracy theory or truth? “The Secret Society” tells of Cecil John Rhodes’s quest to establish a world order. Next: South Korean Han Kang wins Man Booker International for “The Vegetarian”. [LISTEN] Richard Poplak & Kevin Bloom on their book, “Continental Shift”, and the riddle that is Africa. Local children’s imprint wins big at international book fair.